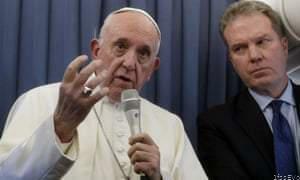 The pope was asked by a journalist what he would say to parents who observe homosexual traits in their children. "When it shows itself from childhood, there is a lot that can be done through psychiatry, to see how things are. It is something else if it shows itself after 20 years," he said. He added that ignoring a child who showed homosexual tendencies was an "error of fatherhood or motherhood". However, when the Vatican later published the pope’s answer, the reference to psychiatry had been removed. When asked why, a Vatican spokeswoman said it had been done in order to not "change the thoughts of the Holy Father". "When the pope referred to ‘psychiatry’, it is clear that he was doing it to highlight an example of ‘things that can be done’. But with that word he didn’t mean to say that it (homosexuality) was a ‘mental illness’," she said. The pope’s trip to Ireland was fraught with controversy amid accusations that he ignored sexual abuse allegations against prominent US cardinal Theodore McCarrick. The town, on the Syrian border some 340 kilometres (215 miles) from Baghdad, was one of the last in Iraq to be recaptured from the Islamic State group in November last year. The 9 am (0600 GMT) bombing also wounded 16 people -- 11 civilians and five security personnel, police Captain Mahmud Jassem said. The Chinese government could be moving to end birth restrictions, amid growing concerns over an ageing population and a dropping birth rate. According to a brief statement released Tuesday by the National People's Congress, the newly revised code "will no longer retain the relevant content of family planning." But a change to the country's strict family planning laws had been considered likely by experts for some time. "The government will lift the policy, to what degree they then go further with pre-natal policy is another issue, but I think they'll lift the policy in the foreseeable future," Therese Hesketh, a professor at the University College London's Institute for Global Health.